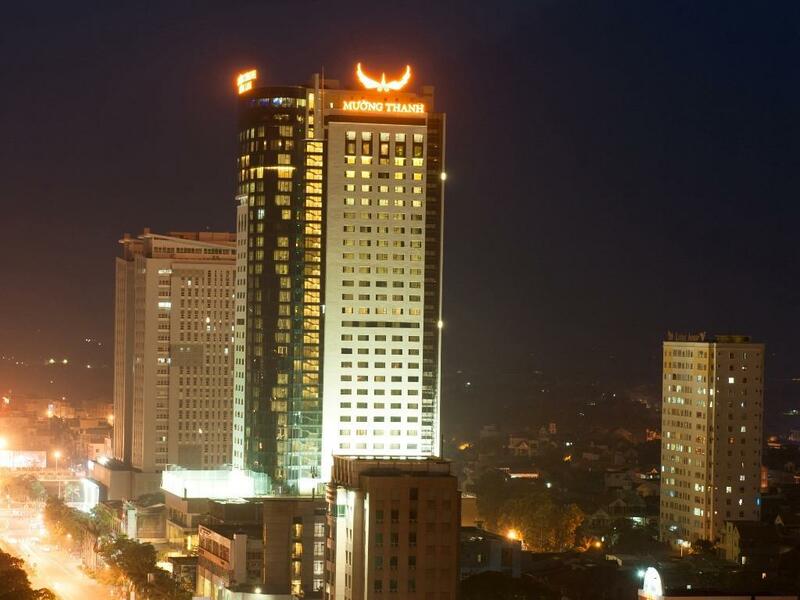 "Right in heart of city centre, great staff and tasteful brea..."
Have a question for Muong Thanh Song Lam Hotel? "The rooms were decent and great value $38/night." "This is the best hotel in Vinh in term of quality and service." "The breakfast is good with different local dishes." "The hotel is comfortable, the rooms are nice and the staff a..."
For travelers who want to take in the sights and sounds of Vinh, Muong Thanh Song Lam Hotel is the perfect choice. Only 07.00 Km away, this 5-star hotel can be easily accessed from the airport. Visitors to the hotel can take pleasure in touring the city's top attractions: Central Park. At Muong Thanh Song Lam Hotel, every effort is made to make guests feel comfortable. To do so, the hotel provides the best in services and amenities. While lodging at this wonderful property, guests can enjoy 24-hour room service, free Wi-Fi in all rooms, 24-hour security, convenience store, daily housekeeping. All guest accommodations feature thoughtful amenities to ensure an unparalleled sense of comfort. The hotel offers many unique recreational opportunities such as hot tub, fitness center, sauna, outdoor pool, spa. Whatever your reason for visiting Vinh, the Muong Thanh Song Lam Hotel is the perfect venue for an exhilarating and exciting break away. Children under 6 years old stay for free if using existing bed. Children 6 - 12 years old will be charged VND 70,000 for breakfast when using existing bed. Guests 13 years and over will be charged VND 140,000 for breakfast. We booked 2 nights and 2 rooms here . The rooms were decent and great value $38/night. We didn’t have enough time to have to have breakfast but it looks like they had variety of choices. They had pho as well as omlets to order . The service was adequate from bell hop to front desk. The only issue was when check out of hotel one had to give all keys back and the maid had to check your room for not taking their towels or drinks before they release you . If you are in a rush, you have to give yourself extra time because they a litttle delay in that. Overall , we enjoyed our stay and definitely recommend prospective guests and will return again. Right in heart of city centre, great staff and tasteful breakfast. It is the first time I stayed at a Muong Thanh Hotel but I was very happy. All staffs are friendly. Room is vey clean. Only air condition does not have warm function. It has only cool and dry. Will be very nice in the summer but not so nice in the winter. I enjoyed my stay at the hotel. I have no complaints. I think the reviews of this hotel are a bit harsh. Please keep in mind that you are staying in a developing country, and 5 stars in such a country may not be comparable to 5 stars in a more developed country. The staff were very understanding and offered us a later check out. I appreciated their attentiveness. A very nice hotel with modern standards, offering a huge breakfast buffet, which was good. The rooms are nicely designed and very comfortable. The view of the city/mountains/sea from the rooftop bar/cafe is simply stunning, there's a side door (no signage) near the elevators that allow access to an open rooftop, 33 floors up! Overall a very good hotel, however no internet connection throughout. The hotel is just opened recently with new and modern facility. The service was also very welcoming for hotel guest. The hotel food was quite nice even though you can get many other delicious food around the city. I stayed here 1 night for a relative wedding at Saigon Kim Lien hotel near by. The rate of this hotel is much cheaper with better facility and service. Even though there are some unfinished building works around, the hotel keep it quality very satisfactory for hotel guests. 5 stars hotel with modern equipments. It's located in the center of Vinh city, 8km far from the airport. It's a little bit far from the hotel to the beach and Hochiminh's country but very easy to take a taxi or bus. The staffs were very friendly and nice attitude, they helped us to find restaurant and everywhere to go. Muong Thanh Song Lam is the best 5 stars Hotel in Vinh you should choose!!! Every morning at breakfast the food that should have been hot was cold. The fridge and snacks in the room was never restocked. Most staff were very very good but some wasn’t good at all. My wife wanted to complain about 1 girl at reception. My wife comes from this city and we return here each year to visit her family, but I’ll try another hotel next time. Overall are the best..... Nothing for me to complain. Khách sạn đồ ăn sáng, nhân viên phục vụ đều tốt. Chỉ có phòng tập gym ít máy và có vẻ ít người sử dụng. Everything is very clean & beautiful. This is the newest (and seems the only) 5-star hotel in Vinh City by the time I visited. Overall experience is good. Great value for money given the hotel's class except a poor choice of breakfast buffet.